Fluoxetine is a commonly prescribed antidepressant compound. Its action is primarily attributed to selective inhibition of the reuptake of serotonin (5-hydroxytryptamine) in the central nervous system. Although this group of antidepressant drugs is generally believed to cause fewer proarrhythmic side effects compared with tricyclic antidepressants, serious concerns have been raised by case reports of tachycardia and syncopes associated with fluoxetine treatment. To determine the electrophysiological basis for the arrhythmogenic potential of fluoxetine, we investigated the effects of this drug on cloned human ether-a-go-go-related gene (HERG) potassium channels heterologously expressed in Xenopus oocytes using the two-microelectrode voltage-clamp technique. We found that fluoxetine blocked HERG channels with an IC50 value of 3.1 μM. Inhibition occurred fast to open channels with very slow unbinding kinetics. 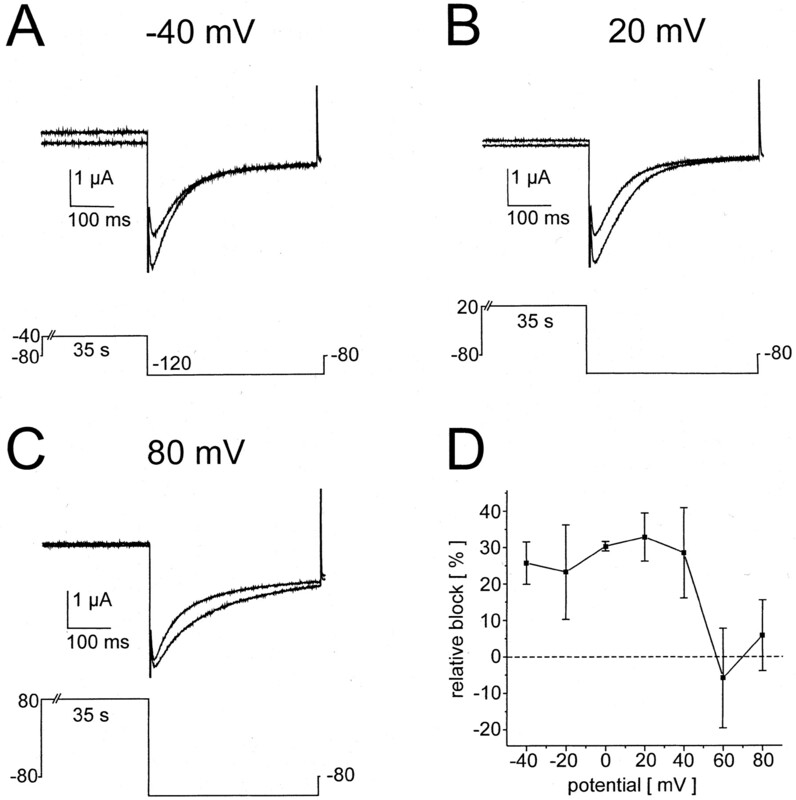 Analysis of the voltage dependence of block revealed loss of inhibition at membrane potentials greater than 40 mV, indicating that channel inactivation prevented block by fluoxetine. No pronounced changes in electrophysiological parameters such as voltage dependence of activation or inactivation, or inactivation time constant could be observed, and block was not frequency-dependent. This is the first study demonstrating that HERG potassium channels are blocked by the selective serotonin reuptake inhibitor fluoxetine. We conclude that HERG current inhibition might be an explanation for the arrhythmogenic side effects of this drug. Fluoxetine, a selective serotonin reuptake inhibitor is widely used as an antidepressant compound (Stark et al., 1985). Recent studies revealed that the complex pharmacological profile of fluoxetine includes various additional effects, such as inhibition of muscular and neuronal nicotinic acetylcholine receptors (Garcia-Colunga et al., 1997), blockade of monoamine oxidase A and B (Leonardi and Azmita, 1994), and reduction of neuronal Kv1.1 potassium and sodium currents (Tytgat et al., 1997; Pancrazio et al., 1998). It has been suggested that fluoxetine might inhibit the K+-induced serotonin release by decreasing the voltage-dependent Ca2+entry into nerve terminals (Stauderman et al., 1992). The frequent gastrointestinal side effects could be explained by actions on potassium currents in jejunal circular smooth muscle cells (Farrugia, 1996). Furthermore, Rae et al. (1995) demonstrated that delayed rectifier K+ channels and Na+ channels in human corneal epithelium are blocked by fluoxetine, and, finally, Pacher et al. (2000) observed inhibitory effects of fluoxetine on cardiac Ca2+and Na+ channels. Selective serotonin reuptake inhibitor antidepressant drugs are generally believed to cause fewer proarrhythmic side effects compared with tricyclic antidepressants (Baker et al., 1997; Roose et al., 1998). However, serious concerns have been raised by case reports of tachycardia and syncopes associated with fluoxetine treatment (McAnally et al., 1992; Livshits and Danenberg, 1997). In addition, a patient with markedly prolonged QTc interval due to fluoxetine has been reported by Varriale (2001), whereas previous experimental and clinical studies did not reveal any prolongation of the QTc interval (Fisch, 1985; Upward et al., 1988; Roose et al., 1998; Gintant et al., 2001). But still the QTc prolongation seen during application of fluoxetine suggests that cardiac repolarization might be affected by this drug. Repolarization of cardiac ventricular myocytes is mainly due to outward potassium currents. One of the most important currents is the delayed rectifier potassium current, IK, which has both rapidly and slowly activating components (IKr and IKs) (Sanguinetti and Jurkiewicz, 1990). Activation of the rapid component of the delayed rectifier potassium current, IKr, sufficiently performs repolarization of the cardiac action potential. The human ether-a-go-go-related gene (HERG) (Sanguinetti et al., 1995) encodes the major protein underlying IKr, and mutations in HERG account for chromosome 7-linked inherited long QT syndrome (LQT-2) (Viskin, 1999; Ficker et al., 2000). Patients diagnosed with LQT-2 present with prolonged QT intervals in the surface electrocardiogram and have a high risk for ventricular “torsade de pointes” arrhythmias and sudden cardiac death. Inhibition of HERG potassium channels can be caused by the class III antiarrhythmic drugs dofetilide (Kiehn et al., 1996), amiodarone (Kiehn et al., 1999), or BRL-32872 (Thomas et al., 2001), and several other compounds, such as the tricyclic antidepressants imipramine and amitriptyline (Teschemacher et al., 1999), the histamine receptor antagonists terfenadine and astemizole (Suessbrich et al., 1996), fluoroquinolone antibacterial drugs (Kang et al., 2001), and the antipsychotic drug haloperidol (Suessbrich et al., 1997). Block of IKr causes lengthening of the cardiac action potential, which produces a beneficial class III antiarrhythmic effect. On the other hand, excessive prolongation of the cardiac action potential can lead to acquired long QT syndrome and life-threatening torsade de pointes arrhythmias (Napolitano et al., 1994). The aim of the present study was to investigate the potential interaction of fluoxetine with cloned HERG potassium channels heterologously expressed in Xenopus laevis oocytes. This approach revealed detailed insights into the biophysical mechanism of HERG channel block by fluoxetine. Procedures for in vitro transcription and oocyte injection have been published previously (Kiehn et al., 1999). Briefly, HERG wild-type (Warmke and Ganetzky, 1994; GenBank accession number: hs04270) cRNA was prepared with the mMESSAGE mMACHINE kit (Ambion, Austin, TX) using SP6 RNA polymerase after linearization withEcoRI (Roche Diagnostics, Mannheim, Germany). Stage V to VI defolliculated Xenopus oocytes were injected with 46 nl of cRNA per oocyte. Two-microelectrode voltage-clamp recordings from X. laevis oocytes were carried out as published previously (Thomas et al., 1999). In brief, recordings were performed using a Warner OC-725A amplifier (Warner Instrument Corp., Hamden, CT) and Pclamp software (Axon Instruments, Foster City, CA) for data acquisition and analysis. Microelectrodes had tip resistances ranging from 1 to 5 megohms. The recording chamber was continually perfused. All experiments were carried out at room temperature (20–22°C), and no leak subtraction was done during the experiments. Concentration-response relationships for fluoxetine block were fit to a Hill equation of the following form:Ifluoxetine/Icontrol= 1/[1 + (F/IC50)n], where I indicates current, F is the fluoxetine concentration, n is the Hill coefficient, and IC50 is the concentration necessary for 50% block. Activation curves were fit with a Boltzmann distribution:G(V) =Gmax/(1 − exp[(V1/2 −V)/k]), where V is the test pulse potential, V1/2 is the half-maximal activation potential, and k is the slope of the activation curve. All data are expressed as mean ± standard deviation. We used the unpaired Student's t test to compare the statistical significance of the results: p < 0.05 was considered statistically significant. Voltage-clamp measurements ofXenopus oocytes were performed in a physiological potassium solution containing 5 mM KCl, 100 mM NaCl, 1.5 mM CaCl2, 2 mM MgCl2, and 10 mM HEPES (pH 7.4 with NaOH). Current and voltage electrodes were filled with 3 M KCl solution. Fluoxetine (Sigma Chemical, St. Louis, MO) was prepared as a 10 mM stock solution in water and stored at −20°C. On the day of experiments, aliquots of the stock solution were diluted to the desired concentration with the bath solution. HERG Potassium Currents Are Inhibited by Fluoxetine. Figure1 shows the effects of fluoxetine on HERG potassium channels expressed in X. laevis oocytes. HERG currents were elicited by a 2-s depolarizing step to +20 mV followed by a repolarization step to −40 mV for 1.6 s to produce large, slowly decaying outward tail currents, which are a characteristic of HERG potassium currents (Sanguinetti et al., 1995). The holding potential was −80 mV. This voltage protocol was repeated every 10 s during superfusion with the drug solution for 30 min. After this monitoring period, test pulses were applied to determine the amount of block. HERG tail currents were blocked by fluoxetine as shown in Fig.1A. To study the concentration dependence of HERG current block by fluoxetine, inhibition of HERG peak tail currents was normalized to the respective control values and plotted as relative current amplitude in Fig. 1B (n = 5 to 9 oocytes at each concentration). The half-maximal inhibition concentration (IC50) for block of tail currents was 3.1 μM with a Hill coefficient of 1.7. Inhibition of HERG channels expressed inXenopus oocytes by fluoxetine. A, representative current traces recorded from the same oocyte under control conditions and after perfusion with fluoxetine (1 μM and 100 μM) are displayed. Currents were elicited by a depolarizing pulse to +20 mV (2 s), and tail currents were recorded during a step to −40 mV (1.6 s). Current amplitudes were monitored during control periods and 30 min of drug application with the same voltage protocol (0.1-Hz pulsing frequency). B, dose-response relationship for the effect of fluoxetine on HERG peak tail currents. Error bars denote S.D. (n = 5–9 oocytes). The IC50 yielded 3.1 μM. C, time course of HERG tail current inhibition by 100 μM fluoxetine. Currents were measured as described above. For simplicity, not all current measurements are displayed. After a control period of 24 min, currents decreased rapidly upon perfusion with the drug solution within 5 min. An additional 25 min of drug application lead to weak additional block (<10%). Holding potential: −80 mV; bath: 5 mM K+. The stability of the preparation is demonstrated during a control period of 24 min (Fig. 1C). The onset of block was fast. After addition of 100 μM fluoxetine to the bath, HERG channel block occurred rapidly, within approximately 5 min. During the following 25 min of drug application an additional weak block (less than 10%) could be observed. Upon washout, the blocking effects on HERG were partially reversible within 45 min (Fig. 1C). Fluoxetine Has No Effect on HERG Channel Activation. The effect of fluoxetine on HERG current-voltage (I-V) relationship was investigated under isochronal recording conditions. Oocytes were clamped at a holding potential of −80 mV. Depolarizing pulses were applied for 2 s to voltages between −80 and +70 mV in 10-mV increments, and tail currents were recorded during a constant repolarizing step to −60 mV for 1.6 s. Families of current traces from one cell are shown for control conditions and after exposure to 5 μM fluoxetine (30 min) in Fig. 2, A and B. The currents activated at potentials greater than −50 mV reached a peak at 0 mV and then decreased at more positive potentials due to inactivation (Sanguinetti et al., 1995; Smith et al., 1996), giving the I-V relationship its typical bell-shaped appearance (Fig. 2C). The peak tail current, measured during the repolarizing second step of the voltage protocol, increased with voltage steps from −40 to +20 mV and then plateaued for test pulse potentials positive to +20 mV (Fig. 2D). HERG currents at the end of the test pulse to −10 mV were reduced by 65.5 ± 9.7%, and peak tail currents were blocked by 62.7 ± 6.7% (n = 6). Figure 2D displays peak tail currents as a function of the preceding test pulse potential, resulting in activation curves. Fluoxetine caused no significant change in the half-maximal activation voltage (V1/2) from −21.8 ± 2.5 mV to −23.9 ± 4.3 mV (n = 6). Application of fluoxetine has no effect on HERG activation kinetics. Control measurement (A) and the inhibitory effects of 5 μM fluoxetine (30 min; B) in one representative oocyte are shown. C shows the resulting current amplitude at the end of the test pulse as a function of the preceding test pulse potential under control conditions and after incubation with 5 μM fluoxetine. The maximum current amplitude at −10 mV is reduced in the measurement with fluoxetine by 63.1%. D displays activation curves, i.e., the peak tail current amplitudes as a function of the preceding test pulse potential during the first step of the voltage protocol, recorded under isochronal conditions. Peak tail currents were reduced by 66.5%, and no pronounced changes in the half-maximal activation potential (V1/2) were apparent (ΔV1/2 = −2.9 mV). Voltage protocol in A and B: holding potential −80 mV, test pulse −80 to +70 mV (2 s) in 10-mV increments, return pulse constant −60 mV (1.6 s). Bath: 5 mM K+. Effects of Fluoxetine on HERG Channel Inactivation. We investigated the effects of fluoxetine on HERG current inactivation by testing whether the rate of inactivation was affected by the drug. Pulses were applied to 40 mV for 900 ms, at which channels are partially open but mostly inactivated. A brief repolarization to −100 mV for 16 ms caused rapid recovery from inactivation without marked deactivation. During a second depolarizing pulse (150 ms) to different voltages ranging from −60 mV to +40 mV (increment 20 mV), large, rapidly inactivating currents were produced. The holding potential was −80 mV. Inactivating currents were recorded before (Fig.3A) and after equilibration of the block with 5 μM fluoxetine (Fig. 3B) by current monitoring for 30 min. Single-exponential fits to the large inactivating currents yielded the time constants of inactivation at different voltages. In these experiments, only minimal changes in the time constant for HERG channel inactivation were observed (Fig. 3C; n = 5–6). Fluoxetine does not markedly affect HERG current inactivation. The time constant of channel inactivation was assessed by 900-ms pulses to 40 mV, followed by a brief depolarization at −100 mV (16 ms). Variable voltage steps ranging from −60 mV to +40 mV (150 ms; increment 20 mV) were consecutively applied to evoke inactivating currents (A). The holding potential was −80 mV. Typical current measurements recorded before (A) and after incubation with 5 μM fluoxetine (B) are displayed. C reflects the corresponding inactivation time constants obtained from single-exponential fits to the large inactivating current traces (n = 5–6). D and E show measurements of the steady-state inactivation at constant 20 mV after various potentials from −120 to 30 mV (increment 10 mV). Note that, for simplicity, not all current traces are displayed. The normalized current amplitude at the beginning of the inactivating current at 20 mV is shown in F, giving the steady-state inactivation curve. There was only a small shift of −6.0 mV from −73.1 mV to −79.1 mV in this experiment. Error bars denote S.D. ; bath: 5 mM K+. In a second approach we measured steady-state inactivation relationships. Channels were inactivated at a holding potential of 20 mV, before being recovered from inactivation at various potentials from −120 to +30 mV (increment 10 mV) for 20 ms. Finally, the resulting peak outward currents at constant (20 mV) were recorded as a measure of steady-state inactivation (Smith et al., 1996). After having obtained the control measurements (Fig. 3D), we applied 5 μM fluoxetine to the oocytes. The holding potential was −80 mV to avoid destruction of the cell, as would occur when holding the cell at 20 mV during the incubation period of 30 min. One typical recording in the presence of the drug is displayed in Fig. 3E. The inactivating outward current amplitude measured at 20 mV was normalized and plotted against the test pulse potential, giving the steady-state inactivation curve (Fig. 3F). Values for the half-maximal inactivation voltage were fit with a Boltzmann distribution and yielded −71.8 ± 2.0 mV for control and −75.3 ± 2.8 mV for fluoxetine measurements (n = 4). There was only a small mean shift of −3.5 ± 1.9 mV in the inactivation curves. Fluoxetine Blocks HERG Potassium Channels Mainly in the Open State. To determine whether the channel is blocked in the closed, open, or inactivated state, we activated currents by use of a protocol with a single depolarizing step to 0 mV for 7.5 s. After having obtained the control measurement, we allowed a 100 μM concentration of the drug to wash in for 30 min while holding all channels in the closed state at −80 mV membrane potential (Fig.4A). Then we performed the measurement with fluoxetine, which showed a rapid current reduction and a small peak after 100 ms. The degree of inhibition (i.e., fluoxetine-sensitive current/control current) after the incubation period is displayed with linear and logarithmic time scales (Fig. 4, B and C, respectively). Analysis of the first 600 ms of the test pulse after fluoxetine application revealed a time-dependent increase of block to about 90% at 600 ms (Fig. 4C), which is consistent with a very fast block of open or inactivated HERG potassium channels, whereas closed channels were not markedly affected by fluoxetine (n = 4). Block of open HERG channels by fluoxetine. A, HERG currents were activated by a 7.5-s depolarizing voltage step to 0 mV from a holding potential of −80 mV. After having recorded the control measurement, the oocyte was held at −80 mV for 30 min during perfusion with the drug solution (100 μM fluoxetine). The control recording and the first pulse measured immediately after the incubation period are displayed. B and C show the degree of inhibition in percentage, recorded 20 ms after the beginning of the test pulse (B, linear time scale; C, logarithmic time scale). Inhibition of current increased from 0% to approximately 90% at 600 ms, indicating that mainly open channels were blocked. Bath: 5 mM K+. To address the question whether HERG current block by fluoxetine varies with voltage, we applied the following methodical approach. Since mainly open or inactivated channels seemed to be blocked and unblocking was slow, only one experiment at each potential could be carried out with one individual oocyte. Activating currents were elicited by 35-s depolarizing pulses ranging from −40 to +80 mV from a holding potential of −80 mV, and peak inward tail currents were recorded during a second step to −120 mV (400 ms). First, control currents were recorded. Then oocytes were superfused with the drug solution (5 μM fluoxetine) while holding the cell at a constant −80 mV for 30 min, at which HERG channels are in the closed state. After this, the measurement at the test pulse potential was obtained. Typical recordings for −40 mV, +20 mV, and +80 mV are shown in Fig.5 (A to C). Percentage inhibition of the peak tail currents was plotted as a function of the preceding test pulse potential (Fig. 5D; n = 4–7 cells studied at each potential). Fluoxetine application reduced the currents throughout all voltages between −40 and +40 mV without marked differences in the degree of blockade. 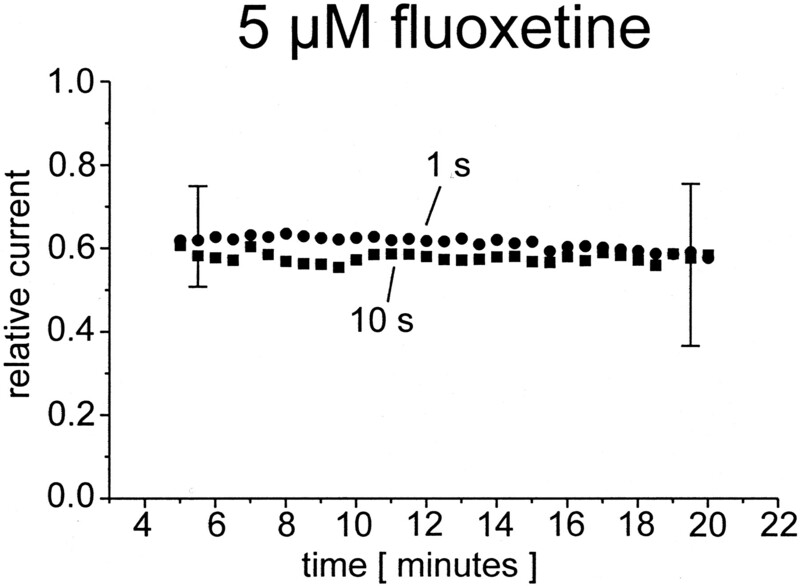 In contrast, there was virtually no effect of fluoxetine at membrane potentials greater than 40 mV, indicating that block by the drug was prevented by very strong channel inactivation. Fluoxetine block of HERG currents is state-dependent. Comparison of typical current traces recorded from a cell after a long depolarizing pulse to −40 mV (A), +20 mV (B), and +80 mV (C), before and after exposure to 5 μM fluoxetine (30 min). D, fraction of blocked control peak tail currents as a function of various test pulse potentials. HERG channel block was prevented by strong channel inactivation at potentials ≥60 mV, whereas no marked changes in the amount of block could be observed at potentials ≤40 mV, indicating that block is state-dependent to open channels and not voltage-dependent. Data are expressed as mean ± S.D., andn = 4 to 7 cells were studied at each potential. Voltage protocol: peak tail currents were measured during a repolarizing step to −120 mV (400 ms) following a test pulse to potentials ranging from −40 to +80 mV (35 s). Holding potential: −80 mV; bath: 5 mM K+. These data indicate further that block was state-dependent to open channels, but not voltage-dependent, as illustrated in Fig.6. Model for state-dependent blockade of HERG potassium channels by fluoxetine. The hypothetical binding site located inside the pore is not accessible for the drug molecule when HERG channels are in the closed or inactivated state. The fluoxetine molecules can access the binding site only when HERG channels are open, consecutively blocking the channels. Lack of Frequency Dependence of Fluoxetine Block. The frequency dependence of fluoxetine block was investigated after the drug was allowed to wash into the bath for 5 min at −80 mV without pulsing. HERG potassium channels were rapidly activated by a depolarizing step to 20 mV for 300 ms followed by a repolarizing step to −40 mV (300 ms) to elicit outward tail currents, before returning to the holding potential of −80 mV. Pulses were applied at intervals of 1 or 10 s under control conditions before drug application and in the presence of 5 μM fluoxetine, with each cell studied only at one frequency. Four oocytes were used at each stimulation frequency. The development of current reduction was plotted versus time (Fig.7). The resulting level of steady-state block is a measure for the frequency dependence of block. At both stimulation frequencies, there were no pronounced changes in the amount of steady-state block. Therefore, block was not frequency-dependent. Lack of frequency dependence of fluoxetine block inXenopus oocytes. HERG channels were activated with a test pulse to 20 mV (300 ms) from a holding potential of −80 mV, and outward tail currents were recorded during a repolarizing step to −40 mV (300 ms) before returning to the holding potential. Trains of pulses were applied at intervals of 1 and 10 s under control conditions and in the presence of 5 μM fluoxetine after an incubation period of 5 min without pulsing, until steady-state block was achieved. The resulting mean relative tail current amplitudes obtained fromn = 4 oocytes are plotted versus time. For clearer presentation, only four error bars were drawn in this figure. There were no marked differences in the amount of steady-state block when pulses were applied at lower stimulation frequencies compared with higher frequencies. Therefore, block was not frequency-dependent. Bath: 5 mM K+. The present results reveal that fluoxetine is a potent inhibitor of HERG potassium channels. Blockade of HERG channels heterologously expressed in X. laevis oocytes displayed an IC50 value of 3.1 μM, which is only slightly higher than the serum concentrations reached in humans (0.14–1.4 μM;Orsulak et al., 1988), although the free plasma concentration is likely to be below the serum concentration due to protein binding. Due to specific properties of the Xenopus oocyte expression system, higher concentrations of drugs are necessary when applied to the extracellular surface of whole oocytes. For example, the block of HERG by dofetilide gave an IC50 that was 20-fold higher when the drug was applied to the bath compared with the application of the drug to the internal surface of the membrane in inside-out membrane patches (Kiehn et al., 1996). One explanation for this observation is that the vitelline membrane and the yolk reduce the actual concentration of drugs at the cell membrane. In addition, the IC50 values found in oocyte experiments differ to a certain degree from the physiological IC50values. The antiarrhythmic drug BRL-32872 blocked HERG channels expressed in Xenopus oocytes with an IC50 of 241 nM, whereas the IC50 value was approximately 12-fold lower (19.8 nM) for mammalian human embryonic kidney (HEK) 293 cells (Thomas et al., 2001). Thus, IC50 values for HERG channel block are approximately 10- to 20-fold lower when the drug is applied to the extracellular surface of Xenopus oocytes compared with patch-clamp experiments using mammalian cells. In conclusion, taking into consideration that the physiological IC50 value for fluoxetine block of HERG in mammalian cells is likely to be markedly lower than 3.1 μM, we assume that HERG current inhibition by fluoxetine might be of physiological relevance. This study was designed to analyze the biophysical mechanism of HERG channel block by fluoxetine in detail, to investigate the possible proarrhythmic properties of this drug. One important finding of this study was that fluoxetine blocked HERG channels with high affinity in the open state, whereas closed and inactivated HERG channels were not significantly affected by the drug molecule. Activation and inactivation parameters were not markedly affected by the drug. Unblocking upon repolarization, which allows HERG channels to become available for opening, occurred very slowly. The lack of frequency dependence can be interpreted as the result of fast blocking and slow unblocking kinetics. The slow rate of unblocking may be due to a trapping mechanism of the drug at its binding site (Mitcheson et al., 2000). 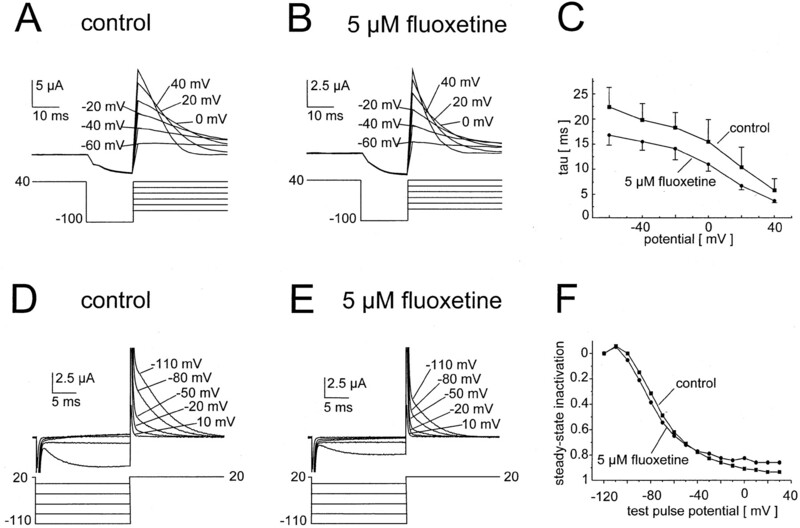 Channel inactivation at potentials ≥60 mV prevented HERG channels from being blocked by fluoxetine. Thus, the binding site is only accessible for the drug when the channel is in the open state, similar to the block of HERG potassium channels by dofetilide (Kiehn et al., 1996; Ficker et al., 1998) and BRL-32872 (Thomas et al., 2001). Although the clinical data pointing toward QTc interval prolongation during fluoxetine treatment are limited, HERG channel blockade might be particularly important when fluoxetine is combined with additional drugs known as inhibitors of HERG potassium channels. In these cases, the inhibitory effects of fluoxetine on HERG channels might lead to severe proarrhythmic events. In comparison with other HERG channel inhibitors such as imipramine or amitriptyline (Teschemacher et al., 1999), fluoxetine seems to have less proarrhythmic potential (Baker et al., 1997; Roose et al., 1998). Similar observations have been made during clinical or experimental application of several antiarrhythmic drugs that are known to block HERG potassium channels, such as amiodarone, verapamil, BRL-32872, and carvedilol, suggesting that HERG current block does not generally lead to severe cardiac arrhythmias with the risk of sudden cardiac death (Kiehn et al., 1999; Zhang et al., 1999; Karle et al., 2001; Thomas et al., 2001). It has been demonstrated that fluoxetine also suppresses cardiac Ca2+ and Na+currents (Pacher et al., 2000), which might reduce its proarrhythmic potential. In particular, the additional effects on calcium channels have been suggested to reduce the proarrhythmic potential of HERG channel antagonists (Bril et al., 1996; Chouabe et al., 1998;Zhang et al., 1999; Thomas et al., 2001). In conclusion, the present results show that fluoxetine is an antagonist of cloned HERG potassium channels, providing a molecular mechanism for the previously reported QT interval prolongation under clinical administration of fluoxetine. Additional calcium channel inhibition might account for the reduced proarrhythmic potential of fluoxetine compared with imipramine or amitriptyline. The excellent technical assistance of K. Güth and S. Lück is gratefully acknowledged. We thank Dr. M. T. Keating for generously donating the HERG clone. This work was supported by a grant from the Deutsche Forschungsgemeinschaft (Project Ki 663/1-1 to J.K.). D.T. was supported by the German National Merit Scholarship Foundation. Data presented here are part of the doctoral thesis of B.G. (1997) Electrocardiographic effects of fluoxetine and doxepin in patients with major depressive disorder. J Clin Psychopharmacol 17:15–21. (1996) Combined potassium and calcium channel blocking activities as a basis for antiarrhythmic efficacy with low proarrhythmic risk: experimental profile of BRL-32872. J Pharmacol Exp Ther 276:637–646. (1998) HERG and KvLQT1/IsK, the cardiac K+ channels involved in long QT syndromes, are targets for calcium channel blockers. Mol Pharmacol 54:695–703. (1996) Modulation of ionic currents in isolated canine and human jejunal circular smooth muscle cells by fluoxetine. Gastroenterology 110:1438–1445. (1998) Molecular determinants of dofetilide block of HERG K+ channels. Circ Res 82:386–395. (2000) Novel characteristics of a misprocessed mutant HERG channel linked to hereditary long QT syndrome. Am J Physiol 279:H1748–H1756. (1985) Effect of fluoxetine on the electrocardiogram. J Clin Psychiatry 46:42–44. (1997) Blockade of muscle and neuronal nicotinic acetylcholine receptors by fluoxetine (Prozac). Proc Natl Acad Sci USA 94:2041–2044. (2001) The canine Purkinje fiber: an in vitro model system for acquired long QT syndrome and drug-induced arrhythmogenesis. J Cardiovasc Pharmacol 37:607–618. (2001) Interactions of a series of fluoroquinolone antibacterial drugs with the human cardiac K+ channel HERG. Mol Pharmacol 59:122–126. (2001) Antiarrhythmic drug carvedilol inhibits HERG potassium channels. Cardiovasc Res 49:361–370. (1996) Molecular physiology and pharmacology of HERG. Circulation 94:2572–2579. (1999) Inhibitory effects of the class III antiarrhythmic drug amiodarone on cloned HERG potassium channels. Naunyn-Schmiedeberg's Arch Pharmacol 359:212–219. (1994) MDMA (Ecstasy) inhibition of MAO type A and type B: comparisons with fenfluramine and fluoxetine (Prozac). Neuropsychopharmacology 10:231–238. (1997) Tachycardia, orthostatic hypotension and profound weakness due to concomitant use of fluoxetine and nifedipine. Pharmacopsychiatry 30:274–275. (1992) Case report of a syncopal episode associated with fluoxetine. Ann Pharmacother 26:1090–1091. (2000) Trapping of a methanesulfonanilide by closure of the HERG potassium channel activation gate. J Gen Physiol 115:229–240. (1994) Torsade de pointes: mechanism and management. Drugs 47:51–65. (1988) Determination of the antidepressant fluoxetine and its metabolite norfluoxetine in serum by reversed-phase HPLC with ultraviolet detection. Clin Chem 34:1875–1878. 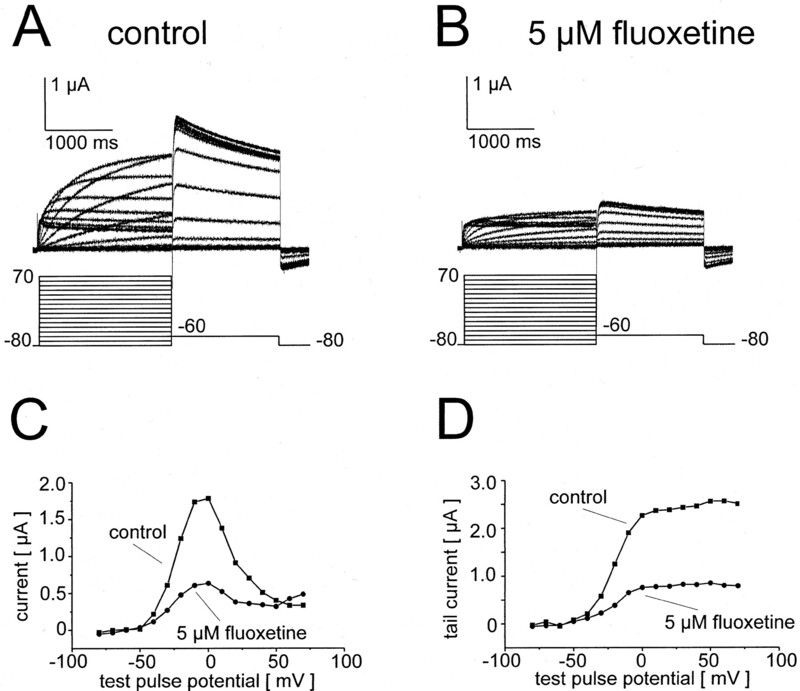 (2000) Electrophysiological effects of fluoxetine in mammalian cardiac tissues. Naunyn-Schmiedeberg's Arch Pharmacol 361:67–73. (1998) Inhibition of neuronal Na+ channels by antidepressant drugs. J Pharmacol Exp Ther 284:208–214. (1995) Effect of Prozac on whole cell ionic currents in lens and corneal epithelia. Am J Physiol 269:C250–C256. (1998) Cardiovascular effects of fluoxetine in depressed patients with heart disease. Am J Psychiatry 155:660–665. (1995) A mechanistic link between an inherited and an acquired cardiac arrhythmia: HERG encodes the Ikr potassium channel. Cell 81:299–307. (1990) Two components of delayed rectifier K+ current. J Gen Physiol 96:195–215. (1996) The inward rectification mechanism of the HERG cardiac potassium channel. Nature (Lond) 379:833–836. (1985) The pharmacological profile of fluoxetine. J Clin Psychiatry 46:7–13. (1992) Fluoxetine-induced inhibition of synaptosomal (3H)5-HT release: possible Ca2+-channels inhibition. Life Sci 50:2125–2138. (1997) The inhibitory effect of the antipsychotic drug haloperidol on HERG potassium channels expressed in Xenopus oocytes. Br J Pharmacol 120:968–974. (1996) Blockade of HERG channels expressed in Xenopus oocytes by the histamine receptor antagonists terfenadine and astemizole. FEBS Lett 385:77–80. (1999) Inhibition of the current of heterologously expressed HERG potassium channels by imipramine and amitriptyline. Br J Pharmacol 128:479–485. (2001) High-affinity blockade of HERG human cardiac potassium channels by the novel antiarrhythmic drug BRL-32872. J Pharmacol Exp Ther 297:753–761. (1999) Deletion of protein kinase A phosphorylation sites in the HERG potassium channel inhibits activation shift by protein kinase A. J Biol Chem 274:27457–27462. (1997) Effect of fluoxetine on a neuronal, voltage-dependent potassium channel (Kv1.1). Br J Pharmacol 122:1417–1424. (1988) Comparative effects of fluoxetine and amitriptyline on cardiac function. Br J Clin Pharmacol 26:399–402. (2001) Fluoxetine (Prozac) as a cause of QT prolongation. Arch Intern Med 161:612. (1999) Long QT syndromes and torsade de pointes. Lancet 354:1625–1633. (1994) A family of potassium channel genes related to eag in Drosophila and mammals. Proc Natl Acad Sci USA 91:3438–3442. (1999) Mechanism of block and identification of the verapamil binding domain to HERG potassium channels. Circ Res 84:989–998.